General Motors is all set to become the first company to mass produce driverless cars. However, a recent GM self-driving car crash with a San Francisco motorcyclist has put the spotlight on the apparent risks of self-driving cars and raised peculiar legal issues about assigning blame in accidents involving these autonomous automobiles. Automotive analysts believe that as the number self-driving cars on the road grows, their accidents with the standard vehicles are almost certain to happen, and lawsuits will follow. On the 22nd of January, the controversial General Motors (they received a bailout rather than going through the bankruptcy process like any small company would have to do if it was in financial trouble) was sued by the San Francisco commercial photographer Oscar Nilsson, after a crash which took place with a self-driving Chevrolet Bolt on December 7th. The Bolt aborted an attempt to change the lane while it was in an autonomous mode, leading to an accident with Nilsson who was riding a motorcycle. Nilsson's lawsuit, filed in the US District Court in San Francisco, has claimed that he was riding behind the self-driving Bolt when the car suddenly changed lanes to the left. As he rode forward, the car with its backup driver veered back into his lane, knocking him down to the ground. Nilsson's lawyer, Sergei Lemberg has challenged the police report on the incident by the San Francisco Police Department, which blames Nilsson for passing the car on the right when it was not safe to do so. On the 23rd of January, Lemberg stated that he did not know what a police officer could tell “after” the incident had taken place. He questioned whether it is fair to blame an innocent person who is simply driving in his own lane and gets hit. Lemberg claims that the police report actually supports the charge to hold GM responsible for the incident. The police report notes that after the Bolt estimated it could not make the lane change, it began to move back while Nilsson was passing on the right side. As the car's backup driver tried to take charge of the wheel and steer away, the collision occurred. While Lemberg demands that GM should take responsibility, the automaker has offered a very different description of the accident, according to the crash report filed with the DMV in California. Although the company has acknowledged that the Bolt had aborted a lane change while in self-driving mode during the heavy traffic, it has disputed Nilsson’s version. GM claims that as the Bolt “re-centered itself” in its lane, Nilsson, who had been lane-splitting (riding between two lanes), moved into the center lane. The motorcycle riding Nilsson then “glanced the side of the car,” wobbled and fell down, according to GM. The company noted in an emailed statement that the police report had concluded that Nilsson had caused the accident. The crash report filed by GM states that Nilsson was driving at 17 mph, while the autonomous Bolt was traveling at 12 mph at the time of the collision. Following the collision, according to the report, Nilsson got up after having fallen down, and walked his motorcycle to the edge of the road. He reported pain in his shoulder and was taken to receive medical aid. Nilsson in his lawsuit has claimed that he sustained shoulder and neck injuries, which will require extended treatment, and that he had to proceed on disability leave. Nilsson has sought unspecified damages. 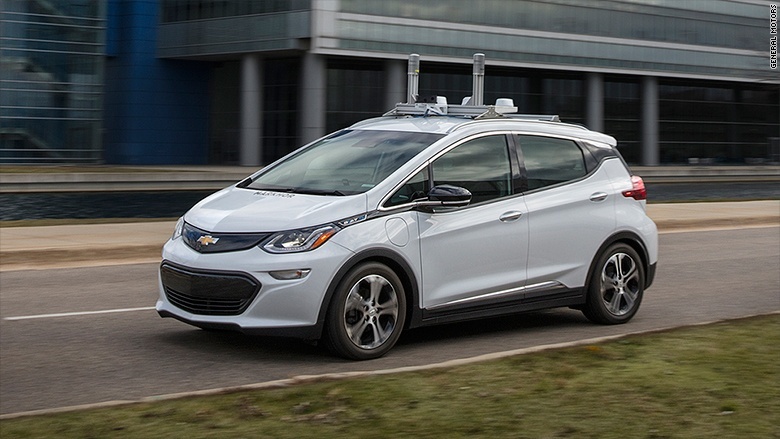 GM has stated that its primary focus is on safety with regard to the development and testing of its autonomous driving technology. The company’s “Cruise Anywhere” program has been running for employees since August, which permits them to utilize self-driving Cruise vehicles to be driven within San Francisco. It remains unclear if the Bolt involved in the accident was a participant in that program. It is also unknown whether the vehicle in question was among the “third generation” of self-driving cars, which had been announced last fall by Kyle Vogt, the CEO of Cruise. Vogt had called these vehicles the first-ever mass-producible self-driving cars in the world. He said that these autonomous cars would be included in the company’s “Cruise Anywhere” program. This incident has highlighted the vulnerability of autonomous driving technology and raised peculiar issues. As self-driving cars cannot behave like human-driven vehicles, it could create challenges for investigators to determine who is at a fault in an accident. John Simpson, a critic of the rapid deployment of self-driving cars, and a spokesperson for Consumer Watchdog, said that safety is going to remain a major area of concern, and self-driving cars on the roads are likely to create all sorts of problems. According to Bryant Walker Smith, a law professor at the University of South Carolina, automobile manufacturers who are operating self-driving cars are likely to settle any accident-related lawsuits quickly when the technology seems to be at fault. However, they will fight with vigor if they believe that the other vehicle’s driver was at fault. That is only logical, right? Smith says that there could be data available that could indicate fault or no fault. This data may include video recordings and other driving information from the self-driving car, and it would aid the crash investigators. Consumer Watchdog’s Simpson says that whenever an autonomous vehicle crashes, the incident should be disclosed publicly. GM’s extensive road tests on self-driving vehicles in San Francisco underscore the company’s focus on mass producing these autonomous cars. Although Google had seized an early advantage in self-driving technology with a program that has now become a separate firm called Waymo, but the automotive manufacturing capabilities and experience of GM enabled it to catch up fast, as per a report by Navigant Research. When accidents occur, legal challenges are bound to arise for self-driving car manufacturers competing to take the lead in a new market. California requires that self-driving car backup drivers should have a judicious driving record. Jessica Gonzalez, a spokesperson for the DMV, said that these drivers should also have successfully completed a test driver training program conducted by the car manufacturer. Autonomous test vehicles could turn up practically anywhere on the roads of California. According to Gonzalez, carmakers with permits can take a test on any public roadway in the state, and they do not have to inform DMV which roadways they may be testing on. GM and its Cruise subsidiary have had a permit to test self-driving cars in California since June of 2015. According to the DMV records, the company has 300 test drivers and 110 vehicles approved for testing on California roads. Wow! On the 22nd of January, a Tesla Model S sedan in Autopilot mode had a rear-end collision with a fire-truck on a freeway close to Los Angeles. The incident triggered the interest of the U.S. National Transportation Safety Board (NTSB), which is collecting details about the accident. NTSB spokesperson Chris O’Neil has said in an emailed statement that the safety board has not made a decision whether to launch a formal investigation into this crash. The board only gets involved with a few highway accident investigations each year. The Tesla driver involved in the crash said that he had engaged the car’s autopilot driver-assist mechanism when it rear-ended a fire-truck going around 65 mph. The union for firefighters in Culver City, California said that fortunately, no injuries occurred in the incident. Mercury News reported that the fire-truck was parked at the side of the highway in an emergency lane attending to another accident when the collision occurred. So this Tesla car was driving outside of its lane, not even in a lane? Wow! Tesla has issued a statement stressing the point that the vehicle’s autopilot system is only meant to be used with a fully attentive driver. The carmaker said that it is making efforts to educate drivers about the importance of keeping their hands attentively on the steering wheel and to be ready to take over from autopilot mode at any time. The autopilot, which the company calls an advanced system for driver assistance, is not aimed at turning the car into an autonomous vehicle which is amazing that it seems some people do not comprehend. The NTSB has said before that the autopilot system of Tesla contributed to a fatal crash in 2016 in Florida. A Model S driver was killed in that incident after the car drove under a semi-trailer that the autopilot’s sensors could not detect. Last year GM began fitting some of its Cadillac cars with a new Super Cruise system that enables the driver to go hands-free on the road. The system uses a camera mounted on the top of the steering wheel to track the driver’s head position and monitor whether the driver is focusing on the road. Now your car is watching you! Advocates for Highway and Auto Safety, a group promoting highway safety is asking lawmakers to slow down the development of self-driving cars. The group has called upon federal officials and Congress to bolster the current set of safety regulations regarding driverless technology. But it does seem the industry is taking lots of precautions according to many people already. Their action follows the results of a public opinion poll that reveals that American people, irrespective of geographic location, political preferences or age, demand increased safeguards. On the 12th of January, Joan Claybrook, a former NHTSA administrator said in a conference call with the media with that it is vital that the US DOT issues car safety standards for autonomous vehicles and implement a statutory mandate. According to Claybrook, the last thing the people would want is to watch DOT on the sidelines, while automotive manufacturers build and sell vehicles with new technologies without having to meet minimum requirements of the government. Well after watching the blockbuster Fast and Furious 8 this issue could even be more glaring in peoples’ eyes since that movie had an intense remote wireless car hijacking scene with a plethora of cars being involved. The survey showed that 64 percent of drivers are concerned about sharing the road with autonomous cars. Nearly three in four respondents in the survey want the DOT to come up with safety standards for the advanced new features that are a part of self-driving cars. The phone survey was carried out from December 7th to the 10th, 2017, and involved 1,005 adult participants across the country. Questions included in the survey ranged from assessing the comfort of the respondents with sharing the roadways with autonomous vehicles to evaluating their opposition or support for regulations. Driverless car development and testing is now on a fast track, with as many as 20 states now permitting some form of testing. According to the California DMV, the state has allowed the testing of dozens of autonomous vehicles by 49 companies. States such as Arizona have adopted an ‘open for business’ approach to self-driving technology. Waymo and Uber are actively testing these autonomous cars on public roads in the state. Congress has, meanwhile, shown an overwhelming support to pave way for the rapid development of self-driving cars, while the US DOT has maintained a largely industry-friendly approach to the development and testing of autonomous vehicles. According to Shaun Kildare, who is a research director with the Advocates for Highway and Auto Safety, the survey results show that the people have serious concerns about the entry of autonomous vehicles and want the federal government to adopt a hands-on approach. The states, on their part, have stressed the issue of safety around driverless cars. According to California DMV, the state has stepped in to start the development of safety protocols for these vehicles. A spokesperson for California DMV, Jessica Gonzalez, said that safety is one of the primary concerns while creating self-driving car regulations in the state. According to Gonzalez, vehicle safety regulations are completed federally, while self-driving vehicle regulations have been pushed to the state level because until 2012 the feds were not prepared to work on them. And because this is a state by state issue like the marijuana situation and so many other subjects such as fracking and so on. However, the Advocates for Highway and Auto Safety say that varying state regulations will not bring industry safety across the board, and it is vital to establish broad federal guidelines. President emeritus of the group, Jackie Gillan, said that it is a vital issue that should be taken up at the federal level. If each state develops different reporting requirements, it may not provide for the comprehensive reporting requirements that are necessary in case of autonomous vehicles. Though many others believe that the industry can govern itself. If these cars are not safe there will be a public backlash and sales will be hurt. The car makers have a strong incentive to be transparent and to respect all other drivers on the road, pedestrians, and so on. I'm Ed Smith, a Sacramento car accident lawyer. Suffering injuries in a car accident can be a devastating experience. If you or a loved one has been injured in an accident, please call me at 916.921.6400 for free, friendly advice. I may also be contacted toll-free at (800) 404-5400 for free, friendly advice. I've offered my assistance to residents of Sacramento since 1982 to retrieve fair compensation for their personal injury and wrongful death claims. The Million Dollar Advocates Forum offers exclusive membership to trial lawyers who have recovered $1 million dollar settlements or verdicts for their clients. I belong to this forum as a California member. Feel free to look at my prior case results listed on my Past Verdicts and Settlements page.